When I went to Penang for the first time eight years ago, I ordered a plate of Hokkien mee for dinner, thinking I was going to get the noodles with the thick and dark sauce and pork lard, as is served in Kuala Lumpur. Imagine my shock when I was served a bowl of noodles in prawn stock, with prawns, pork slices and kangkung. 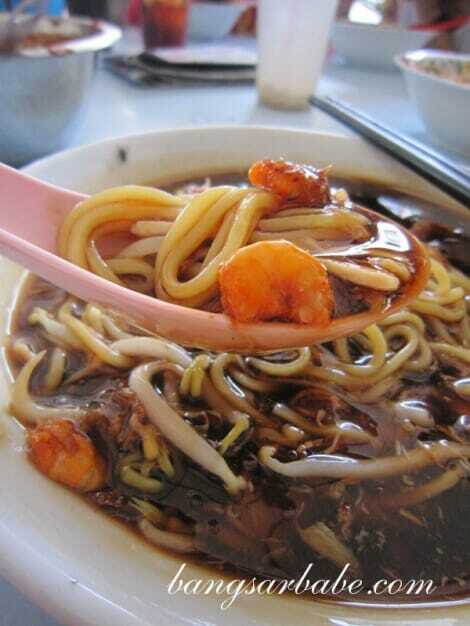 My Penangite friend then educated me: if I ever order Hokkien mee in Penang, I will get the prawn soup version, not the dry, dark sauce version I’m accustomed to. 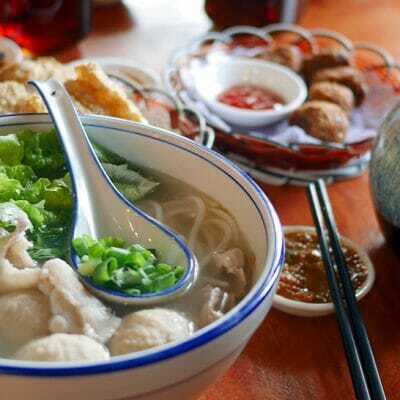 I have never been an enthusiastic fan of the soupy version – unless it is richly flavoured and comes with plenty of prawns, pork ribs and pork slices. 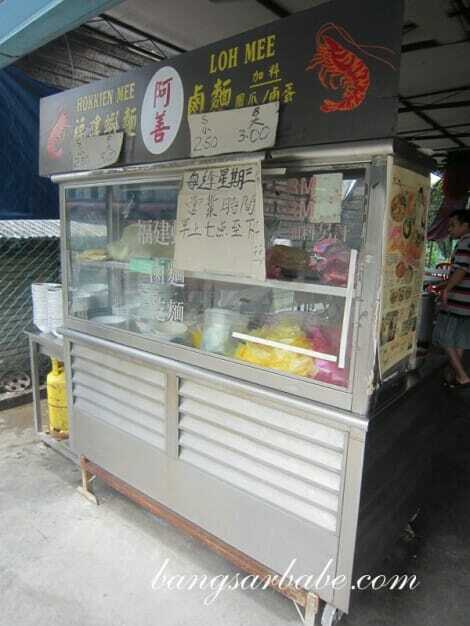 Many people have recommended such flavourful Hokkien (or prawn) mee versions at well-known places in George Town and on Penang island but the fiancee Rif and I recently discovered a really good one hidden away in Bukit Mertajam – and when we say “hidden”, we mean it because the stall is located in the compound of a house! 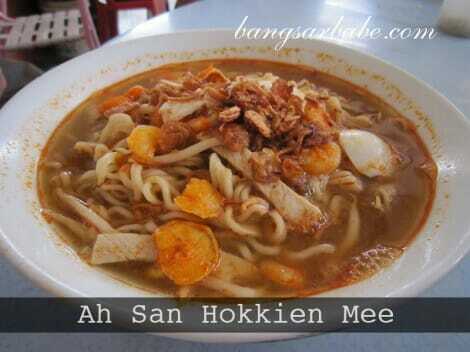 Many thanks to Tiang, who told us about the obscure gem, Ah San Hokkien Mee. 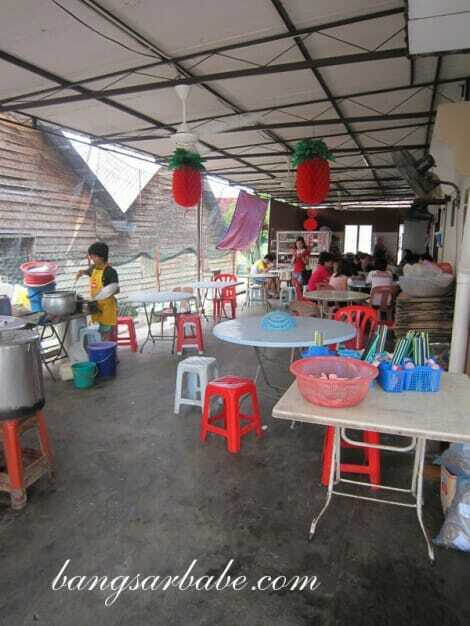 My friends and I only reached the stall around 2.30pm – good thing there were still noodles left for us! We took a seat at a large round table in the porch of the house and waited as patiently as our growling tummies allowed for our food. I wanted to try different items so I decided to order the lor mee (RM3, large) while Rif ordered the Hokkien mee (RM3, large). 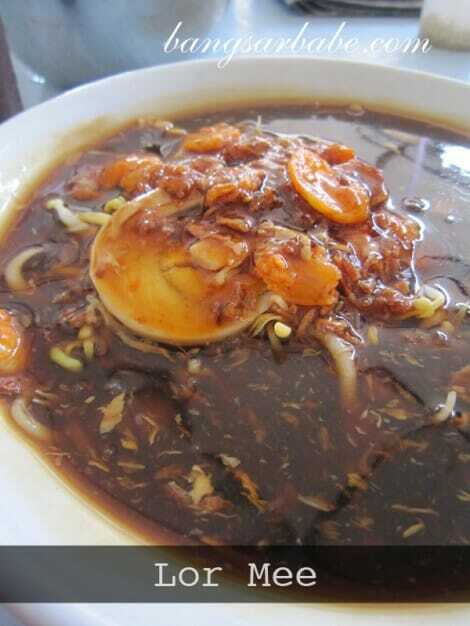 The Hokkien mee stock was incredibly aromatic, brownish in colour and dotted with tiny specks of burnt-orange oil. I reckon the stock got its rich colour and concentrated flavour from the prawn shells. Every sip of the broth was a sweet, savoury and prawn-y delight. Before you say, “Must be the MSG talking,” I’m happy to report that I didn’t feel thirsty after the meal – to me, that’s a sure sign that it was MSG-free. 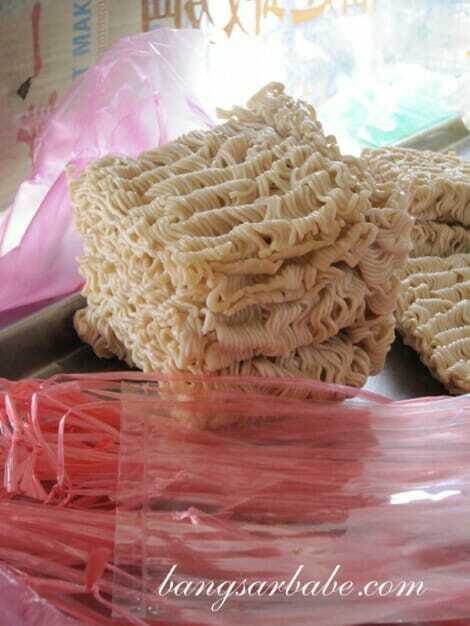 Instant noodles are a popular choice to go with the soup, and that was the type we asked for. The curly noodles were springy and firm to the bite; they went well with the flavourful broth. I found plenty of pork slices, tiny shrimp and deep fried shallots in the bowl. Delicious when eaten with a generous dollop of homemade sambal chilli. That chilli packed a punch, so go easy on it. My lor mee (noodles in a thick, braised-meat sauce) was also quite good albeit slightly lacklustre compared with the Hokkien mee. The noodles were cooked al dente and nicely coated with the thick, dark brown gravy. It also came with a generous amount of pork and shrimp, and slices of hard-boiled egg. The broth was slightly sweet in flavour with a rich aftertaste from the egg mixture. Really shiok, especially with the sambal! I spied a skinny guy tucking into an extra large bowl of the Hokkien mee with gusto. If only I had known there was such a thing as an extra large bowl, I would have ordered one too! 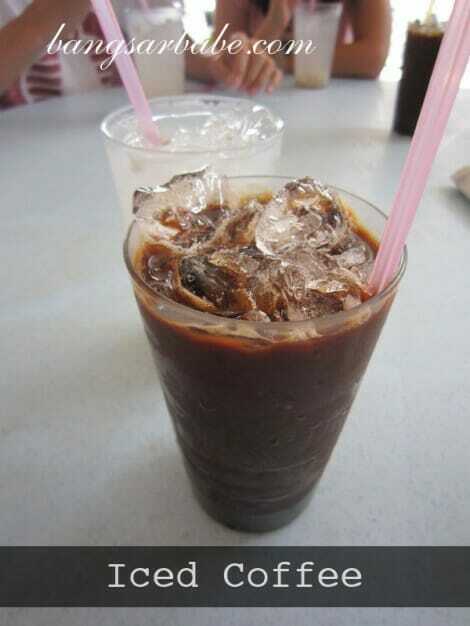 My iced coffee (RM1.40) was very kau (strong) with a deep coffee aftertaste. A good wake-me-up drink after all that travelling. All in, I was quite pleased with my noodles. Ah San also sells braised pig trotters, which were dark, fragrant and looked quite promising. But we had no room in our tummies to try them; oh well, I’ll leave that for my next trip up north! 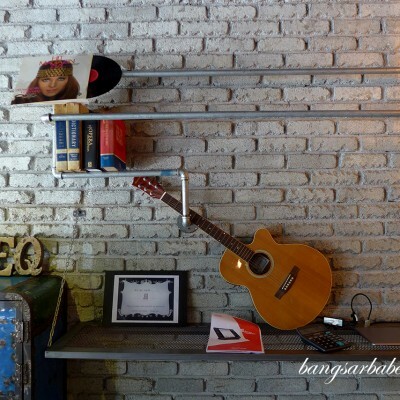 *Read it in Star2Sunday HERE. 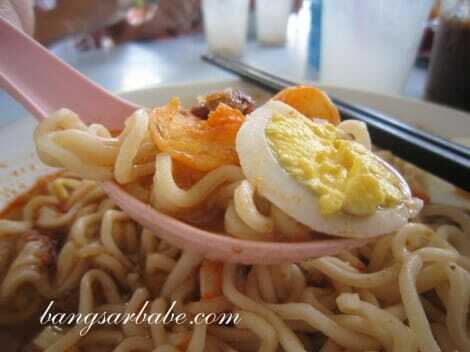 Verdict: One of Penang’s best kept secret — the noodles are worth the wait! GPS coordinates: N05 18.177 E100 28.608. You really can makan! Extra large bowl summore! I envy you! Can eat so much without gaining an inch! 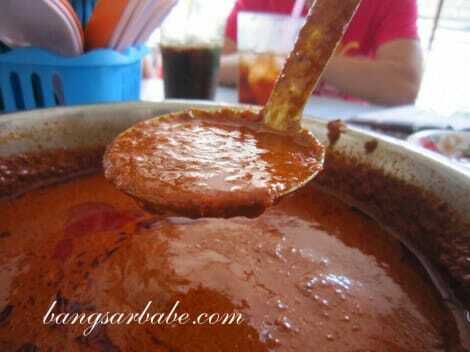 That chili sambal thing looks quite interesting. Not like the ones I’m accustomed too. Thanks for the find, will try to locate it the next time I’m headed up there. Need to find new places to eat when I’m up in Penang. Anyway, just want to inform you that I’ve also recently migrated to http://alilfatmonkey.com. Please update your RSS and blogroll. Thanks very much!